You are here: Home / Health / Four Great Reasons to Hire a Personal Trainer/Guru. Four Great Reasons to Hire a Personal Trainer/Guru. Weeks or even months later, I run into these same people and I see absolutely zero results. In fact, 90% of them have quit on their fitness program! It’s frustrating for three reasons: One, once a person quits, it’s hard to get them re-inspired. Two, many of them suffer injury and are forced to quit. Three, inevitably many of them end up back at the start line. 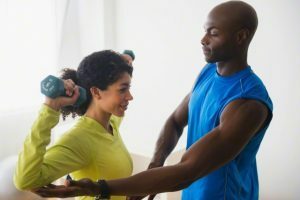 While it may not be in every person’s budget to hire a trainer, it makes good sense to at least consult with one before beginning a fitness program. Here are four great reasons why you should consider working with fitness professionals and the advantages such pros brings to your success. Structure is important for any type of improvement program, not the least of which a program to improve your body’s ability to meet the demands of your physical environment. Without structure, you are just exercising willy-nilly. There’s no clear definition or path to success in your activity. Even the simple things like sets and reps play into proper structure. A fit pro will design a program based upon what’s best for your fitness goals, fitness level and your desired fitness body. With a structured program, you are able to see clearer and more measureable results than if you were going it alone. Those results are in line with your goals. Do you really want to face your trainer and tell him or her that you didn’t do cardio the day before? Studies have shown that most people who begin working with a fit professional tend to lose more weight and adopt better lifestyle habits than those who do not. The reason? Accountability. A fit pro is the extra push you need. A good professional will always cut through the excuses and justifications that clients tend to raise. Personal trainers wear many hats, including confidant, role model and strategist when it comes to holding you accountability both to your investment and your results. Expertise is often the decisive factor in whether a self-started fitness regimen succeeds or fails. Yes, you can Google a workout program based on certain criteria, but most of those programs are cookie-cutter-based and do not address your specific needs or challenges. You get an effective workout program based on your body’s needs, not the average Joe or Jane. Your trainer becomes the ‘expert’ on your body and partners with you in charting the best route to your goals. Form, technique, injury-prevention and exercise programming are just a few things among many that a good trainer brings to your fitness journey. Besides, it’s not getting the weight off that matters – most people can do that by themselves – it’s following certain physiological methods that keep the weight off that counts. Let’s face it. The majority of people need inspiration. I could write another book on why in our society people are so de-motivated. There is a spark that lies within you; sometimes that spark just needs to be lit from someone outside of you. A fit pro is your biggest cheerleader. Your success is their success. A fit pro will do anything to keep you inspired. To an authentic professional, you represent more than just a revenue stream. You are an unfolding human flower, opening to your potential with each rep and each set. There is nothing more beautiful to a committed fit pro than a person training their body and shaping their lives with the end-goal of getting better! It makes good sense to at least consult with a fitness professional before beginning a fitness program!